Registrations for ASA NSC 2018 are now open! Save time and money by registering online. Please follow the prompts in the link below. Registration can be paid using the secure online credit card processor. Changes to your registration details can be made online until Friday, 21 September 2018. Thereafter, any changes to registration details must be emailed to the Registration Manager at registration@asa2018.com.au. Please see below for your appropriate registration fee, keeping in mind the closure date. To maintain you pre-registered conference rate, you are required to pay within seven days from the date of invoice. Please keep this in mind if you are required to obtain prior authorisation. It is preferred that early bird registration is paid by credit card online at the time of registration. However, a tax invoice is available on request. Online payments can be made with Visa and MasterCard only. Onsite registration will be charged the appropriate late registration rates plus a $20.00 manual processing fee. Additional tickets may be purchased for additional persons to attend the social functions. Please indicate this during the registration process. The deadline for early bird registration is Wednesday, 11 July 2018. You must register before this date to receive the early bird rate. After this date, all new and unpaid registrations will be charged the standard registration rate. The deadline for Standard Registration is Friday, 28 September 2018. You must register before this date to receive the standard rate. After this date, all new and unpaid registrations will be charged a $50.00 late fee. Day registration is permitted for a single day attendance only. If you would like to attend more than one day, a full registration must be purchased. You must register and pay before Friday, 28 September 2018 to receive this rate. After this date, all new and unpaid registration will be charged a $50.00 late fee. ASA Advanced Trainee financial members are entitled to claim one complimentary NSC registration. This is claimable once only either while you are an Advanced/Provisional Fellow Trainee or within the first year of becoming an ’Ordinary’ member (provided you have been a financial APFT member for previous 2 years).Associate Registration – is only available to those who met the ASA criteria for Associate Membership. 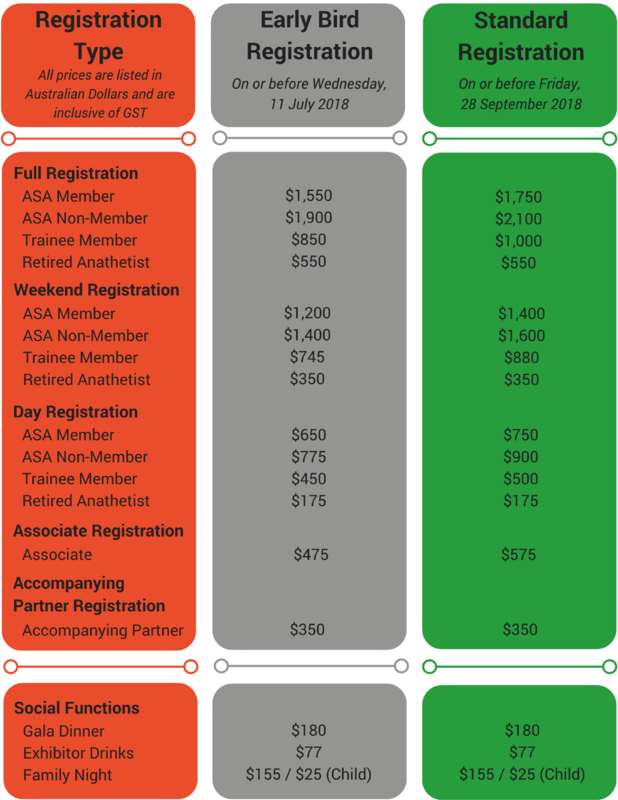 Associate Member – ASA Associate members are medical practitioners registered to practice in Australia who are registrars-in-training or have a special interest in anaesthesia (e.g. GP Anaesthetists). Reciprocal Rates – Available for members of the NZSA, AAGBI, ASA (US), CAS, MSA, SSA, SAHK, ISA, KSA, ESA and Indoanesthesia. All fees are due upon registering. Where early bird prices are applicable, fees must be paid by the early bird date in order to receive the reduced rate. All fees must be paid in full prior to attending the event. Any outstanding fees are to be paid by the registrant upon arrival at the event; failing this, the registrant will be required to provide credit card details to guarantee payment within two (2) weeks after the completion of the event. The conference only accepts Visa and MasterCard. Credit card payments will appear on your statement as Australian Society of Anaesthetists Ltd National Scientific Congress. Please include your invoice number when submitting an EFT payment and provide a copy of the remittance to the Registration Manager at registration@asa2018.com.au. Registration, social function(s) or accommodation cancellations and amendments cannot be accepted over the telephone. All cancellations and amendments must be advised in writing to registration@asa2018.com.au. Cancellations received up to and including Wednesday, 5 September 2018 will receive a full refund, less $100.00 administration fee. Cancellations received between Thursday, 6 September 2018 and Friday, 21 September 2018 will receive a 50% refund less $100.00 administration fee. No refunds will be given for cancellations received after Friday, 28 September 2018. Alternatively, your registration may be transferred to another person until Friday, 21 September 2018 at no extra cost. All amendments including transfers made after this date will incur a $20.00 administration fee. Please refer to the individual hotel’s cancellation policies and terms and conditions on the Congress website. Accommodation cannot be reserved without credit card details. Accommodation cancellations received less than 30 days prior to the congress, will be charged by the hotel according to their cancellation conditions. All cancellations and amendments must be advised in writing to registration@asa2018.com.au. Please do not contact the hotel directly. International Conferences & Events (ICE) Pty Ltd reserves the right to deny entry and/or terminate the registration of any person who demonstrates behaviour that is deemed to be inappropriate and/or a risk to others. Registrations received by International Conferences & Events (ICE) Pty Ltd will not be considered as confirmed unless full payment has been received. While attending the congress you may be photographed and/or filmed. By registering for the congress you agree to these mediums being used for promotional purposes. Reserve the right to change the program and social functions at any time without notice. Do not cover individuals against the cancellations of bookings for any reason, including cancellation or postponement of the congress or for theft, loss or damage to personal belongings. Do not take responsibility for injury or damage to a person, or their property, occurring during the congress or associated activities. Do not accept any responsibility for insurance as this is not included in the registration fee. Insurance is the responsibility of the individual and participants are advised to take out personal insurance, including cover for travel, accommodation and personal possessions. Does not accept responsibility for any financial or other losses incurred by participants, in the event of industrial disruptions or natural disasters. Advise that the opinions expressed by presenters are personal and do not necessarily reflect the opinions of the Organising Committee, Australian Society of Anaesthetists (ASA) and International Conferences & Events (ICE) Pty Ltd.
International Conferences & Events (ICE) Pty Ltd will gather and record personal information necessary for your attendance at the congress. Personal information will be gathered, stored and disseminated in accordance with the National Privacy Principles. Should you have any questions regarding registrations, please contact the Registration Manager at +61 2 9368 1200 or by email at registration@asa2018.com.au.